Our Low Vision Research Laboratory is home to cutting-edge low vision rehabilitation research. Dedicated to the advancement of rehabilitation methods, our laboratory evaluates and develops behavioral therapies for patients with limited remaining vision, as well as for those who are blind. Through a patient-oriented approach, we design, improve and implement techniques and technologies to help individuals with vision loss achieve greater independence. The Low Vision Research Program was established in 2008 when Dr. Janet Szlyk, a career rehabilitation scientist in the field of low vision, joined The Lighthouse as Chief Executive Officer. With her distinguished research background, Dr. Szlyk’s expertise has expanded our ability to offer superior integrated low vision care with an emphasis on innovation and collaboration. We are proud to be partnering on research efforts with other innovative organizations serving our target population, including the Arlene R. Gordon Research Institute at Lighthouse Guild, Wicab, Inc. and Jesse Brown VA Medical Center. The Intracortical Visual Prosthesis Project: Sponsored by the National Institute of Health, BRAIN Initiative, The Chicago Lighthouse is collaborating with IIT, Johns Hopkins University, The University of Chicago, and The University of Texas at Dallas on a project to develop an intracortical visual prosthesis (ICVP) that will aim to restore visual perception for those who are blind. The Lighthouse’s Low Vision Laboratory will be the testing site where subjects will be evaluated once the ICVP has been implanted. Benefit Assessment Tools for Substitute Prosthetic Regeneration and Ultra-Low Vision: Sponsored by the National Institute of Health, The Chicago Lighthouse Is collaborating with Johns Hopkins Wilmer Eye Institute in the development of an assessment tool to assess outcomes for the ultra-low vision population. With the growing number of therapies, prosthetics and treatment modalities, this study will provide validated tools to quantify the meaningful benefits of visual substitution and restoration science. This project will have a major impact on future sight-restoration trials, and will ultimately lead to greater opportunities to provide focused rehabilitation methods for a group that may have otherwise been misrepresented in terms of rehabilitation strategies. Reading in Pediatric Vision Impairment: The Chicago Lighthouse is collaborating with The University of Alabama, Birmingham in an observational study focused on the development of reading skills among young children with visual impairment, that are learning to read. This study will focus on understanding the processes that are most important for reading success in children with low vision in hopes of developing future programs and techniques to maximize reading success. Reading Rehab: Sponsored by the Department of Veterans Affairs, this study involved teaching individuals with central vision loss to use their remaining vision in the most efficient way possible. This eye movement training uses a computer-based system that oversees the training exercises and has shown significant improvement in reading speeds over time. Systematic Evaluation of Assistive Technology: For the past five years, The Chicago Lighthouse has partnered with Wicab, Inc to evaluate the safety and effectiveness of the BrainPort device and provide training for its use. Our recently completed study focused on evaluating the BrainPort’s use by patients who are profoundly blind due to traumatic injury. Outcomes of Low Vision Rehabilitation: This study examined self-report outcomes of low vision rehabilitation in order to evaluate rehabilitation practices and determine common factors that impact outcomes of rehabilitation. 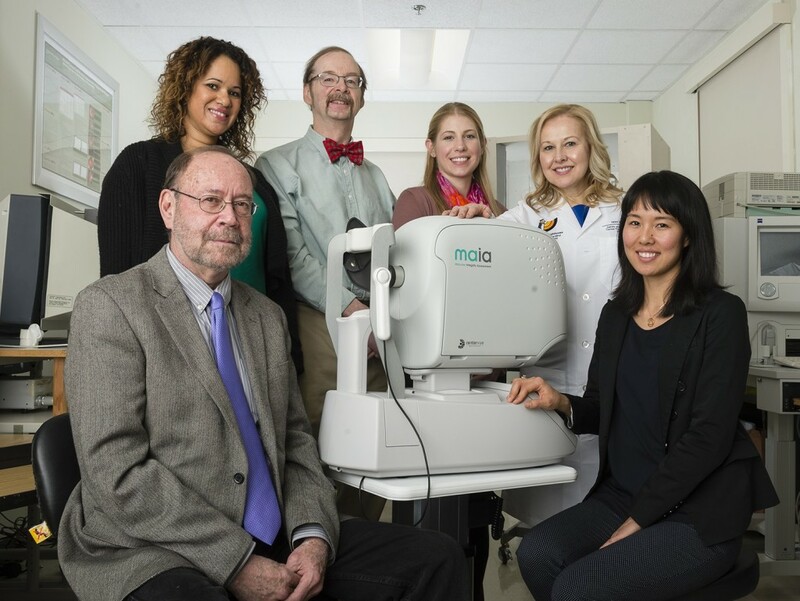 The Chicago Lighthouse continues to be a champion for low vision related research and is home to a cutting-edge low vision rehabilitation research laboratory. As part of our mission to serve individuals who are visually impaired, blind, disabled and Veterans, our organization would be happy to consider your project needs. All requests for evaluation of technology and participant recruitment (for surveys, focus groups, etc) at The Chicago Lighthouse, are required to complete an application for review. Please note that an approval for distribution of recruitment materials by The Chicago Lighthouse is for resource information purposes only and is not an endorsement of the research. For additional information, please contact Meesa Maeng at meesa.maeng@chicagolighthouse.org. Click here to see what opportunities are currently available. Watch a selection of videos on cutting edge devices that are changing the way people with visual impairments see the world.